Northstar Games creates products designed to bring friends and family together through games. I was fortunate enough to receive one of their many products: Wits and Wagers Family. 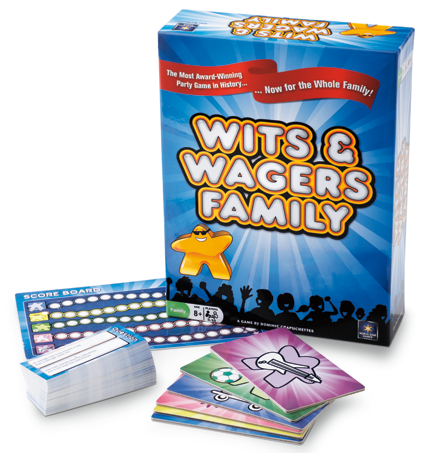 Based on their popular game by the same name, Wits and Wagers Family has simpler, family-friendly questions so that everyone can join in the fun. Intended for ages eight and over, the game features over 300 questions based on everything from pop culture to home living. The game is easy and fun to play. One person reads a question and everyone comes up with a guess. The person with the closest guess without going over is the winner. Don't like your guess? No problem. Just place your Meeple (a cute little playing piece) on the guess you do like. It is not required that you choose your own guess. You earn points based on the guess you wrote and where your Meeple is placed. Meeples come in two sizes and the larger Meeples are worth more points. It's that easy! As far as family-friendly games go, this one ranked high with me for ease of play, amount of playing time, and cost. As explained above, the game is super easy to play. All the children could participate, even the ones that weren't eight or over. The amount of time playing can be completely up to you. Play can end when the first person reaches a certain number of points, or when the score cards are full. Since we play games usually before bedtime, we set a timer for 25 minutes and the person with the highest point total at the time won. Wits & Wagers Family can be purchased on amazon for $15.23. Pretty good price for a family game. My only disappointment with the game was the number of pop culture questions that were TV and/or Tween based. These kinds of situations don't factor into our lives much and were hard to answer. My kids didn't know what Froot Loops are, let alone how many colors are in the cereal. I liked the Meeples. They were funny shaped. I am not sure if I liked it or not because it was hard to get the right answer. I really liked it because there was a big wager and a little wager. My favorite colors! Pink and purple people [Meeples]. Is it time to nurse yet? Disclaimer: As a member of the TOS homeschool review group I received this product free of charge in exchange for an honest review on this blog. I received no other compensation. This is Andrew from North Star Games. I was wondering if you could repost your post onto amazon.com or target.com. Thanks so much for playing our games!